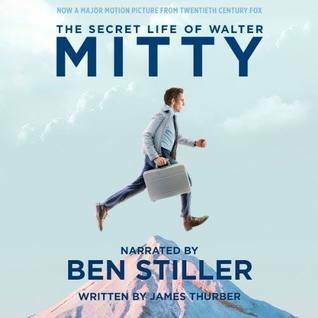 From Goodreads: Comedy superstar Ben Stiller (Zoolander, Tropic Thunder), who directs and stars in the movie, The Secret Life of Walter Mitty, here narrates the classic James Thurber short story on which his film adaptation is based. The mild-mannered Mitty escapes his extremely humdrum and ineffectual existence by leaping into a myriad of fantasies – imaginative daydreams that range from piloting a Navy plane to performing as a brilliant surgeon to coolly leaning against the wall of a firing squad, all while escorting his wife on their regular shopping trip to Danbury, Connecticut. This well-known and beloved tale has launched its famous protagonist into the cultural lexicon, warranting his inclusion in English-language dictionaries and countless anthologies. Stiller’s imaginative performance as Mitty is the perfect re-introduction to the classic character and is a great preface to the upcoming film, for old fans and new listeners alike. The audible version of this 30 page short story was a free download, so I picked it up and listened to Ben Stiller read it. Stiller actually has the perfect voice for this story, and I loved hearing him change his voice as he read, giving readers queues that sometimes don’t transcend in the plain written word. The story follows Walter Mitty as his wife constantly nags him about errands he needs to run while she gets her hair done. As a reader, I wanted to strangle her because she came across as an extremely annoying character, but in her defense, her husband, Walter, is always daydreaming, and it becomes obvious that he has a tendency to get so wrapped up in his own world that he disregards, forgets, or otherwise doesn’t hear those around him. It’s kind of a sad story—Walter’s only means of escape from his mundane world is through the thoughts in his head, where he becomes the hero of every story and does something noteworthy with his life. While I think this is a very well done audible, and I liked Ben Stiller’s voice, the story didn’t leave me with much in terms of thought. I neither liked it nor disliked it; it just was. That being said, I have no desire to actually see the movie, and I’m not really interested in reading any of Thurber’s other works. Two stars. Though I’ve never been a huge fan of him, Stiller seems like he can be a really interesting director, given the right time and material to work with. Nice review. Thanks! I’m not really a fan of him either, but there is potential. I watched the movie and liked it, I love everything about travel, but it was kind of slow. I didn’t know it was a book!